The totally summer-day-proof treat goes on sale today. Calling all ice cream fans (which, as we know, is most of us): No longer do you have to race against the clock to scarf down your whole cone. 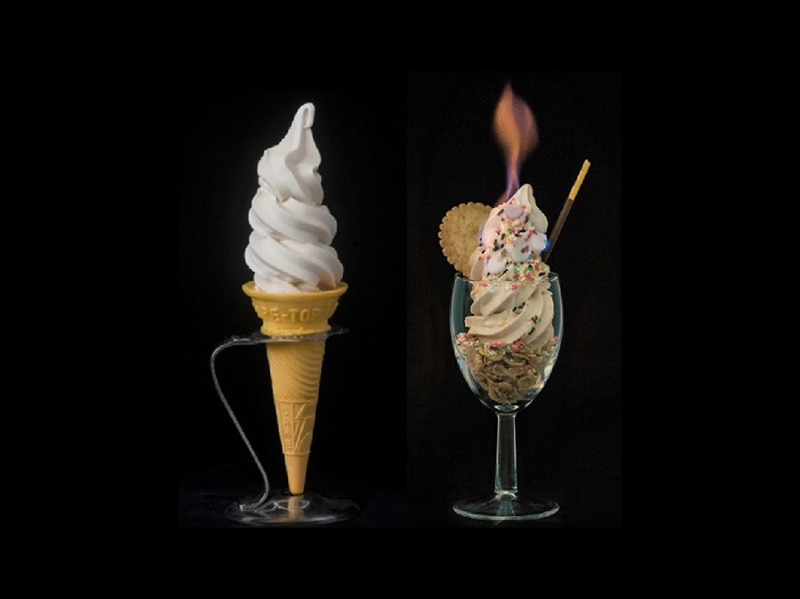 Japanese food scientists recently invented an ice cream so ridiculously melt-proof that not only can it hold its temperature for hours in warm rooms, but it can also withstand being lit on freaking fire. You might remember the popsicles released by the same team, Kanazawa Ice, this past summer. Now they're bringing us melt-free soft serve and parfaits. The Kanazawa Ice soft serve, which went on sale today, pretty much holds its shape and temperature even after three hours in a 104˚ room, so you really don't need to worry about it dripping after a half hour on even the hottest of summer days. If you leave it out for a longer period of time it will eventually get to be more of a cold pudding consistency than a spiral of soft serve ice cream, but, even then, it probably beats melted ice cream soup. A cone of it costs 390 Japanese Yen, or about US$3.50. The "burning" parfaits will go on sale a week from tomorrow, on January 30. This ice cream parfait, which apparently takes on a bit of a crème brulee flavor as it burns, includes the non-melting ice cream, sprinkles, a cookie, and a Pocky-type chocolate stick. It costs 700 Japanese Yen, or roughly US$6.30. You can watch a video of the earlier Kanazawa Ice products in action in this video from Brazil, recorded in Portuguese, on a webpage written in Japanese. Still, you don't need to speak Portuguese or Japanese to be amazed, a minute and a half in, when they put the ice cream right up in front of a hairdryer and it completely holds its (adorable heart) shape. The soft serve cones and parfaits will both be available at the Kanazawa Ice stores in Harajuku and Osaka. For more, follow Kanazawa Ice on Instagram.